The What: Roland Systems Group is unveiling a new portable video converter line-up, VC-1 Series, at the NAB show in Las Vegas April 8 – 11, Booth #C7140. These new video converters address the demand for high-quality, lossless video and audio converters for live/post production as well as installed systems. They include the Roland VC-1-HS (HDMI to SDI), VC-1-SH (SDI to HDMI), and VC-1-DL (Bi-directional SDI/HDMI with audio/video delay and frame sync). The What Else: The VC-1 Video Converter series provides uncompromising picture quality by maintaining the video characteristics of the original signal with rich-blacks and super-whites, according to the company. There are no interlacing artifacts or other conversion or signal errors. The VC-1 series also features an on-board re-clocker to compensate for attenuation of SDI signals carried over long distances. The VC-1 series also supports both level A and B 3G-SDI, letting you connect a variety of higher quality SDI sources. Roland VC-1-HS- Increasingly HDMI video cameras are being used for live production. The VC-1-HS converts, extends and embeds audio from HDMI to SDI. This converter is especially complimentary to the Roland V-1600HD and V-800HD multi-format video mixers when you want to use SDI signals for camera inputs on the mixer. 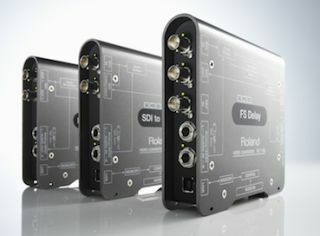 Roland VC-1-SH – The VC-1-SH converter allows you to convert an SDI signal to HDMI, providing a more cost effective monitoring solution. This converter is also complimentary to the Roland V-40HD multi-format video mixer when you want to use an SDI camera as an input to the mixer. Roland VC-1-DL – In live production as you add more video components to a signal flow, latency is introduced. The VC-1-DL converter not only allows bidirectional conversion of SDI/HDMI but it also provides frame sync and delay adjustment of up to 9 fields (4.5 frames) for audio and video independently. This is helpful when keeping various types of cameras in sync as well as ensuring a projector stays in sync with an LED wall.